Humorous takes on favourite tales which boost reading skills, build fluency and keep your class chuckling with lots of read-aloud fun! Students will have oodles of fun building essential reading skills with rib-tickling versions of beloved fairy tales turned into read-aloud plays. Even your most reluctant readers won’t be able to resist these hilarious twists on their favourite stories – Spiderella, Goldilocks and the Three Bullfrogs, The Posicle Boy, Little Late Riding Hood, The Cheetah and the Sloth, Rafunzel and many more! 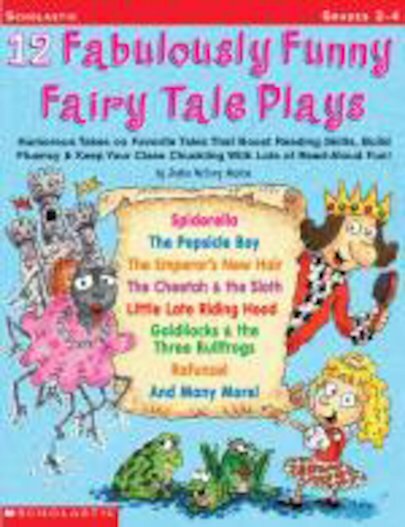 Each play comes with instant discussion starters, vocabulary boosters, imaginative writing prompts and a brief history of the featured fairy tale.